The FFG-ICT of the Future exploratory project SemEO started with a kick-off meeting on October 7, 2016 in Salzburg. The overall goal of SemEO (Semantic enrichment of optical EO data to enhance spatio-temporal querying capabilities) is to investigate conceptual strategies and technical framework conditions to enhance the semantic enrichment of optical EO data. It aims to reach a status allowing human users the querying of EO data on a higher semantic level. Background: Big earth data is a challenge for efficient and intelligent storage, analysis and distribution. While for other big data domains the main challenge is the sheer amount of data, satellite data needs conversion into information first to unfold their potential as a source for relevant multi-temporal geoinformation. State-of-the-art EO image retrieval is based on simple metadata text information only (acquisition time, target geographic area, cloud cover estimate), without the possibility of higher semantic content-based querying of images or spatio-temporal image-content extraction. 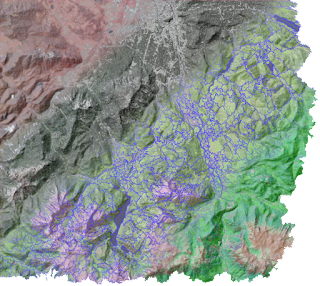 SemEO tackles these limitations and builds upon a novel semantic querying system for content-based image retrieval from multi-source big earth data – a result of the successful FFG-ASAP project AutoSentinel-2/3. PhD defense within the Doctoral College "GIScience"
Yesterday, Ivan Tomljenovic, PhD candidate of the Doctoral College „GIScience“defended successfully his PhD Thesis „Transferable and robust building extraction from airborne laser scanning data using Object-Based Image Analysis Paradigm". In his thesis Ivan provided a new research approach that employs the Object-based methodology on point cloud data obtained from ALS systems in order to extract tangible information in the form of building outlines. The research focused on the analysis of the point cloud derivatives defined as 2.5D and 2D representations and knowledge modelling in a form or rule set implemented with the Cognitional Network Language (CNL) which is integrated within eCognition software as a framework container. The core results of this thesis clearly show that it is possible to use the object-based methodology in order to extract building outlines with more than 90 % accuracy. More than 45 attendess listened to Ivan's impressive presentation which was followed by a fruitful discussion between Ivan and the evaluators, Dr. Stefan Lang from Z_GIS and Dr. Peter Reinartz from the Earth Observation Center in Munich. We wish Ivan all the best for his future career and endeavours! 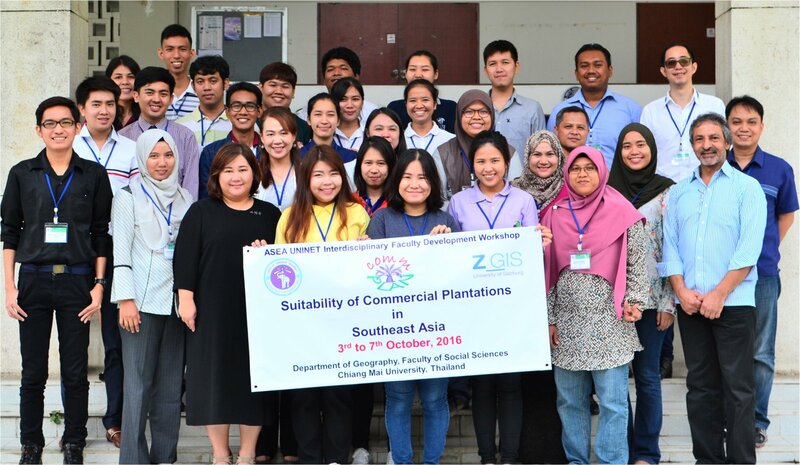 The Department of Geoinformatics - Z_GIS concluded a week-long international capacity building workshop on 'Assessing the Suitability of Commercial Plantations in Southeast Asia (comm-PLAN)' at Chiang Mai University (CMU), Chiang Mai, Thailand. The workshop was organised jointly by Z_GIS with the Department of Geography (D-of-Geog), CMU from October 3-7, 2016 and also included a field excursion for ground truthing on October 7. The comm-PLAN project was co-funded by ASEA Uninet Austria. The comm-PLAN participants rejoicing their successful start and completion of the workshop! Dr. Shahnawaz (Z_GIS) and Dr. Chanida Suwanprasit (D-of-Geog) conducted the workshop at CMU and trained the participants in using various spatial analysis methods ralated to suitability assessment. Focusing on an interdisciplinary approach, 27 teachers and postgraduate students from 10 universities located in 4 countries (i.e. Indonesia, Malaysia, Philippines and Thailand) participated in the workshop. The trainees worked on individual projects assessing the suitability of a range of commercial plantations in Southeast Asia using ArcGIS Desktop and MaxEnt software. All of them presented interesting outcomes in the concluding session. Asso. Prof. Dr. Ajchara Wattanapinyo (Head, D-of-Geog) conferred the certificates of successful completion on the workshop participants and congratulated them for having benefited from this international workshop. She also conveyed her gratitude to Z_GIS as well as to ASEA Uninet and expressed their willingness to host more such workshops in the near future. 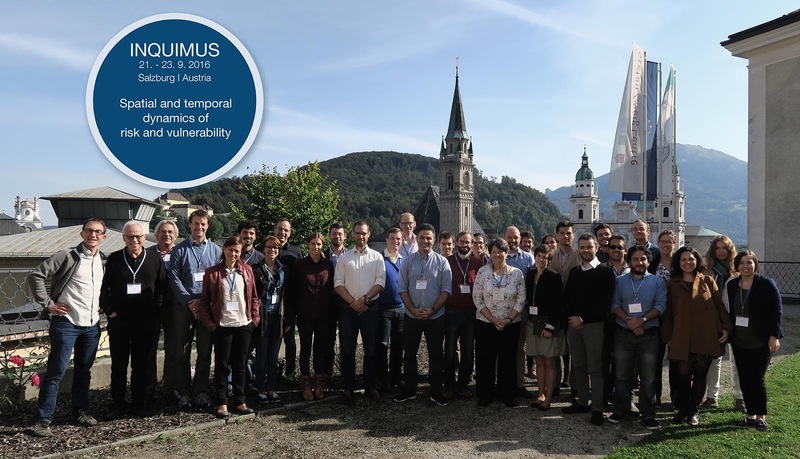 ,Spatial and temporal dynamics of risk and vulnerability’ was the topic of the third INQUIMUS workshop. The workshop was successfully held from 21st – 23rd of September 2016 at the Edmundsburg above the old city of Salzburg. The thematic focus of the 2016 workshop was on scenarios relevant for assessments of risks and vulnerabilities. The scientific committee was made up of members of Z_GIS, EURAC, the University Ca'Foscari (Venice), the HVRI /University of South Carolina and the United Nations University. The meeting gathered more than 30 participants with a high diversity of different thematic backgrounds as well as profiles from junior to distinguished senior scientists. Discussions and presentations where held in a very interactive way, which define the unique character of INQUIMUS workshops as platform of exchange [link to agenda]. The workshop started with an inspirational talk about ‘The futurist from Salzburg - Robert Jungk’ from Stefan Wally of the Robert Jungk Library for Future Studies. State-of-the-art talks were provided by various experts and scientists in the field: Hans-Martin Füssel (European Environment Agency, DK), Susan Cutter (Univ. of South Carolina, USA), Jasper van Vliet (Vrije University, Institute for Environmental Studies, NL) and Anne Goujon (IIASA, AT). A range of posters was presented, including case studies of risk and vulnerability assessments or the development of new indices or data input for scenarios. As a common conclusion, open issues to be addressed in the context of ‘risk and vulnerability scenarios’ were identified. Predicting the behavior of rock mass is of paramount importance in tunneling and mining, as well as in earthquake prediction and geothermal energy utilization. Experts from Graz University of Technology – Institute of Rock Mechanics and Tunnelling, RHI Veitsch Radex GmbH & Co OG, and the Department of Geoinformatics - Z_GIS, University of Salzburg, work together in a project called "Devastating micro cracks: researching spontaneous rock failure with rock mechanical testing, µCT, OBIA and geostatistics (ROCKBURST)”. This 3-year project funded by FFG presents a multidisciplinary approach to research the influence of micromechanical and microstructural characteristics and their individual effect on rock failure. State-of-the art rock mechanical testing, data acquisition and simulation methods will be nested in an innovative work-flow: Following initial mineralogical investigations, artificial and natural rock samples will be each be subject to cycles of destruction-free microstructure analysis and compression testing. From each cycle, Micro-computed tomography (µCT) will provide 3D data on the sample’s micro-fabric before a successive step of uniaxial testing controlled by acoustic emission testing is carried out. 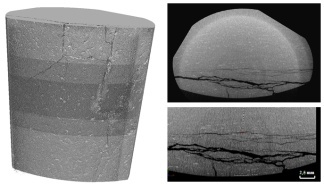 From the resulting series of µCT data, Object-based Image Analysis (OBIA) will assemble a process (3D+t) model of microcrack evolution in each sample. Multiple-point geostatistics simulation, based on training images provided by OBIA, will be used to upscale OBIA results from sample scale to excavation scale. The consortium members of the ‘GeoServices-4-Sustainability (GeoS4S) project from 10 partner universities located in Europe (4), China (3) and Thailand (3) met at the Xinjian Institute of Ecology and Geography (XIEG), Chinese Academy of Sciences (CAS) in Urumqi from 24th to 28th September, 2016 to review project progress at the completion of Year 1. 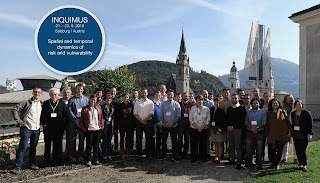 The Interfaculty Department of Geoinformatics - Z_GIS, University of Salzburg, Austria serves as coordinator of this project, co-funded by the European Commission under the ERASMUS+ programme from October 2015 to October 2018. The two major objectives of GeoS4S project are to develop teaching/learning resources of 20 modules; and to organise summers schools for testing the relevance and operational feasibility of these modules. Twenty two experts involved in the project gathered to review the progress of the project during Year 1 and to fine tune the activities planned for Year 2. The progress was considered highly satisfactory as all the partners have fulfilled their tasks and some have even exceeded expectations. The experiences gained during the first year were used to re-align the schedule of some future activities, and the consortium agreed to conduct a short-term review after 3 months during a workshop planned in February 2017 at Wuhan University, China.